Can interest charges double the cost of HE participation? Those Student Finance Calculator thingies are damn addictive. Hours can fly by when you’re sliding the little pointers up and down, watching how total repayment sums (and periods) change depending on variables like inflation, salary growth and average earnings. They’re a great idea, but I do wonder how successfully young people manage to negotiate them. Can applicants really predict how RPI will change over the next three decades? How do they estimate their average annual pay rises? All I had to worry about at that age were beer prices in the Students’ Union. The calculator’s default setting help, of course. Currently, they put average inflation at 3%, salary growth at RPA +2%, and average UK earnings growth at RPI +1%. Based on those assumptions, a student’s maximum total repayment in today’s money is £90,400 for a 3-year degree (costing £50k, including living costs) and £124,290 for a 4-year degree (costing £66.7k). That’s assuming you’re paying maximum tuition fees and receiving the maximum maintenance loan, with London weighting. Pay Day Lender extortion? No, far from it. But still huge sums for many students. Interest charges can’t quite double the cost of participation, but they can increase a graduate’s lifetime repayments by over 80%. 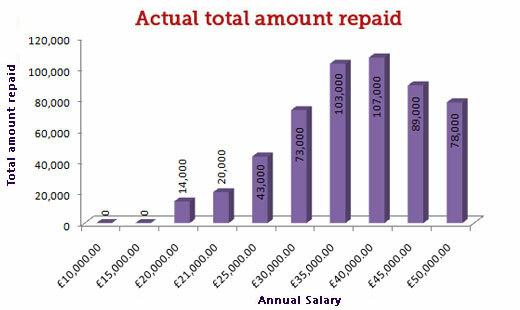 What the calculator also shows is that total repayments go up and up with your expected starting salary. Until, that is, they start going down and down. That’s the regressive nature of the system that I’ve mentioned before; it’s also discussed here by Ron Johnston. Take Ruth, a stay-at-home student who begins a 3-year course at an £8k-a-year university in September 2013. She qualifies for no grants or bursaries, and takes out no maintenance loans. With a starting salary of £16.5k, Ruth’s lifetime repayments will be a mere £30, just one pound per year. This shows the system is working – Ruth is a low earner so her degree costs are being heavily subsidised. As Ruth’s hypothetical starting salary goes up, so too do her lifetime repayments. As you’d expect. That is, until we set Ruth’s starting salary around £36k, at which point total repayments peak, and then begin to fall. If Ruth is lucky enough to have a starting salary of £50k, she’ll pay three grand less in interest charges. If she starts on £60k, she’ll avoid paying a further £1.3k. This is where ‘it’s a tax, not a debt’ line of argument begins to collapse. What kind of tax hits middle earners harder than higher earners? And don’t forget that the very wealthy have the option to repay the debt immediately upon graduation, thereby avoiding interest entirely. Of course, to call it a ‘debt’ is also misleading. Debt collectors aren’t known for being generous towards those on low incomes, nor do they tend to ‘forgive’ after 30 years. In fact, any starting salary under £25.5k will mean that Ruth’s total lifetime repayments are actually lower than the loans she took out. And any starting salary under £21.5k means that she’ll get her degree for under ‘half price’. According to some reports, the concessions to low-earners make the student loan repayment structure hugely expensive. For Nicholas Barr, professor of public economics at the London School of Economics, the solution is a “no-brainer“: drop the repayment threshold from £21k to £18k so that low-earners pay back more of their loan (“the purpose of student loans isn’t to help the poor,” Professor Barr says, “there are much better ways of doing that”). But why not first remove the concessions for very high earning graduates? The fairness case certainly seems much stronger. After all, you can (just about) understand why the City hotshot may feel the price of her degree shouldn’t be higher than the middle-earning schoolteacher’s. It’s essentially the same product. But is there really an argument that the price of her degree should be lower? This entry was posted in 2012 Fee Structure, Student Debt and tagged debt, student finance, student loans. Bookmark the permalink.